Give your projects an authentic, handmade feel. Be it social media, web designs, print media or artworks - stand out from the crowd. 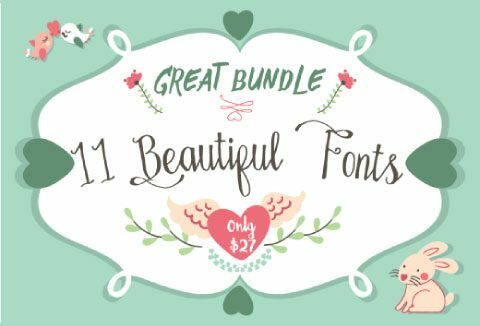 Today, we have compiled a bundle of 11 stylish & beautiful handmade fonts that will bring an artistic touch to whatever you create. Amazinga typeface is a gorgeous display serif font that sports a crisp Victorian style. This handmade typeface is a fabulous display font with a Victorian edge to it. As a bonus, you'll even get hand drawn vector illustrations. This adorable script typeface includes more than 300 glyphs and features a variety of OpenType features such as Stylistic Alternates, Ornaments, Swashes, and more. Bold and modern, Maudy Script is a multipurpose typeface that features 272 glyphs, alternate characters and loads of OpenType features. Another beautiful handmade script typeface, Stellanova is spot on perfect for wedding invitations, greeting cards, vintage designs and more. With 290 glyphs and alternate characters, Melliana is a fabulous handmade script font. Nadhine Script is a new handwritten stylish copperplate calligraphy fonts, combines from copperplate to contemporary typeface, classic and elegant touch..
Refreshingly beautiful, Mellissa Script is a handmade script font that can really set your Apparel Brand aflame thanks to its 214 glyphs, alternate characters and OpenType features. The Ariana Script typeface rounds out this fabulous collection of 11 fonts, with its beautiful curves. Besides alternate characters, many of these fonts include a ton of OpenType features such as alternate characters, swashes, ornaments, stylistic alternates and more. Feel free to use any of these fonts for as many personal or commercial projects as you'd like. These fonts may be used for both personal and commercial purposes, for both your and your clients' projects. The files include both desktop and web fonts and are in .otf, .ttf, .eot, .svg and .woff formats. These fonts cannot be re-sold or shared in any way. In order to access the alternate characters and glyphs, you will need Adobe Illustrator or Adobe InDesign.